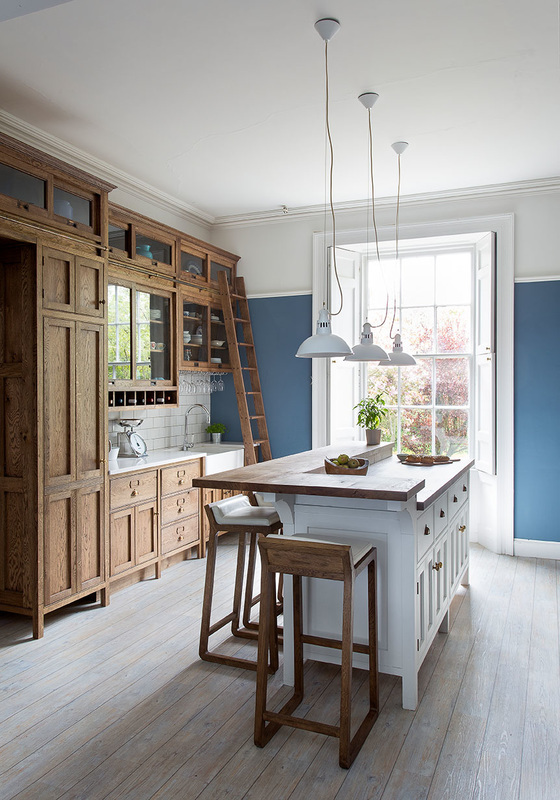 If you have picked up the October 2015 issue of Homes and Gardens magazine you may have noticed this stunning kitchen refurbishment in a 200 year old former manse house in Fife. Bespoke kitchen designer-maker Ewan Ogilvie of Ogilvies of Haddington was asked to create a traditional kitchen for this historic Georgian home but with a contemporary twist to suit a family with three young sons. Ewan selected Camaro luxury vinyl tiles in White Limed Oak to bring light into the room and contrast against the dark oak apothecary style kitchen units. As well as working beautifully with Ewan’s design scheme, Camaro was a great choice for this busy family as it is hard-wearing and easier to maintain than a real wood floor. We think Ewan has done a fantastic job and it goes to show that our lighter, modern wood effect vinyl flooring designs can work well alongside more traditional solid wood furniture as well as in minimalist Scandi style interiors. Browse through the full Camaro range on the Polyflor at Home website for inspirational ideas on how you can transform your own home.